American test pilot astronaut 1978-1993. Grew up in Paton, Iowa. Status: Inactive; Active 1978-1993. Born: 1944-09-23. Spaceflights: 3 . Total time in space: 16.09 days. Birth Place: Jefferson, Iowa. Loren Shriver is Vice President, Engineering and Integration, for United Space Alliance and is USAs Chief Technology Officer. He is responsible for Engineering and Integration functions and processes, software engineering and product system software processes, and technology development and innovation management processes and functions. Shriver is a former Air Force test pilot and NASA astronaut. Beginning in 1997, he was Deputy Director for Launch and Payload Processing at Kennedy Space Center (KSC). In 1993, he became Space Shuttle Program Manager, Launch Integration, at KSC. In this position, he was responsible for final Shuttle preparation, mission execution, and return of the orbiter to KSC following landings at Edwards Air Force Base, CA. He most recently served as USAs Deputy Program Manager of the Space Shuttle Program from 2000 to 2006. Shriver has flown in 30 different types of single and multiengine civilian and military fixed-wing and helicopter aircraft. He has logged over 6200 hours in jet aircraft and holds commercial pilot and private glider ratings. He was commissioned when he graduated in 1967 from the United States Air Force Academy. From 1969 to 1973, he served as a T-38 academic instructor pilot at Vance Air Force Base, Oklahoma. He completed F-4 combat crew training at Homestead Air Force Base, Florida, in 1973 and was then assigned to an overseas tour in Thailand until October 1974. In 1976, he began serving as a test pilot for the F-15 Joint Test Force at Edwards Air Force Base. Selected as an astronaut by NASA in January 1978, Shriver is a veteran of three space flights and has logged more than 386 hours in space. His missions include STS-51C in 1985, STS-31 in 1990, and STS-46 in 1992. In October 1992, he was assigned as Deputy Chief of the Astronaut Office. In 1993, he accepted the Space Shuttle Program position at KSC, and retired from the Air Force as a Colonel. Shrivers accomplishments have earned him many notable awards. He has received the United States Air Force Distinguished Flying Cross, the Defense Superior Service Medal, the Defense Meritorious Service Medal, the Air Force Meritorious Service Medal, and the Air Force Commendation Medal. His NASA awards include the NASA Distinguished Service Medal, the NASA Outstanding Leadership Medal, and the NASA Space Flight Medal (three times). 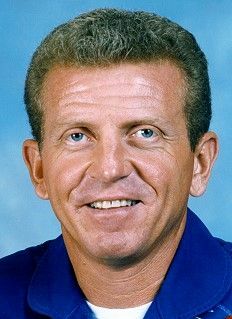 In 1990, he received the Flight Achievement Award from the American Astronautical Society and the Haley Space Flight Award from the American Institute of Aeronautics and Astronautics. In 2008, Mr. Shriver was inducted into the Astronaut Hall of Fame. He earned a bachelor of science degree in aeronautical engineering from the United States Air Force Academy in 1967. The following year, he received a master of science degree in astronautical engineering from Purdue University. He is originally from Paton, Iowa. BIRTHPLACE AND DATE: Born September 23, 1944, in Jefferson, Iowa, but considers Paton, Iowa to be his hometown. His parents, Mr. and Mrs. Darrel R. Shriver, still reside in Paton, Iowa. PHYSICAL DESCRIPTION: Blond hair; blue eyes; 5 feet 10 inches; 160 pounds. EDUCATION: Graduated from Paton Consolidated High School, Paton, Iowa, in 1962; received a bachelor of science degree in aeronautical engineering from the United States Air Force Academy in 1967 and a master of science degree in astronautical engineering from Purdue University in 1968. MARITAL STATUS: Married to the former Susan Diane Hane of Paton, Iowa. Her father is deceased; her mother resides near Jefferson, Iowa. CHILDREN: Camilla Marie, July 15, 1969; Melinda Sue, September 27, 1970; Jered Loren, December 19, 1973; Rebecca Hane, January 24, 1977. RECREATIONAL INTERESTS: His hobbies are softball, running and exercising, camping, backpacking, and sailboarding. ORGANIZATIONS: Member of the Society of Experimental Test Pilots and the Air Force Association; life member of the Air Force Academy Association of Graduates and the Air Force Academy Athletic Association; and member of the American Institute of Aeronautics and Astronautics. SPECIAL HONORS: Received the Defense Superior Service Medal, the Air Force Meritorious Service Medal, the Air Force Commendation Medal, 2 Air Force Outstanding Unit Awards, and the National Defense Service Medal; named High School Class Valedictorian, a USAF Academy Distinguished Graduate, a USAF Pilot Training Distinguished Graduate, a Squadron Officer's School Distinguished Graduate, and the USAF Test Pilot School Distinguished Graduate; recipient of the F-4 Combat Crew Training Academic Award. EXPERIENCE: Shriver was commissioned in 1967 upon graduation from the USAF Academy in Colorado Springs, Colorado, and subsequently attended graduate school for one year at Purdue University. From 1969 to 1973, he served as a T-38 academic instructor pilot at Vance Air Force Base, Oklahoma. He completed F-4 combat crew training at Homestead Air Force Base, Florida, in 1973, and was then assigned to an overseas tour in Thailand until October 1974. In 1975, he attended the USAF Test Pilot School at Edwards Air Force Base, California, and upon completion of this training was assigned to the 6,512th Test Squadron at Edwards. He has completed Air Force Squadron Officer's School and the Air Command and Staff College correspondence course of study. In 1976, Shriver began serving as a test pilot for the F-15 Joint Test Force at Edwards Air Force Base. He has participated in the Air Force development test and evaluation of the F-15 fighter aircraft and has participated in or conducted several follow-on systems tests on the same aircraft. He also took part in the Air Force development test and evaluation of the T-38 lead-in fighter. Shriver has been contributing author on six technical reports for these various programs. He has flown in 30 different types of single- and multi-engine civilian and military fixed-wing and helicopter aircraft, has logged over 5,000 hours in jet aircraft, and holds commercial pilot and private glider ratings. NASA EXPERIENCE: Shriver was selected as an astronaut candidate by NASA in January 1978. In August 1979, he completed a one-year training and evaluation period, making him eligible for assignment as a pilot on future Space Shuttle flight crews. In September of 1982 he was selected as pilot for the first Department of Defense mission, STS-10. That mission was later canceled. 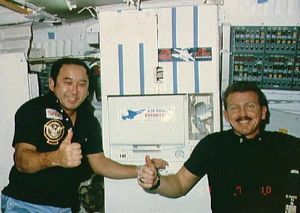 Shriver was pilot of STS 51-C which launched from Kennedy Space Center, Florida on January 24, 1985. He was accompanied by Captain Thomas K. Mattingly (spacecraft commander), Colonel James F. Buchli and Lieutenant Colonel Ellison S. Onizuka (mission specialists), and Lieutenant Colonel Gary E. Payton (DOD payload specialist). STS 51-C performed its DOD mission which included deployment of a modified Inertial Upper Stage (IUS) vehicle from the Space Shuttle Discovery. Landing occurred on January 27, 1985, after slightly more than 3 days on orbit. More recently, Shriver was spacecraft commander of STS-31 crew, which launched on April 24, 1990, from the Kennedy Space Center in Florida. The crew members aboard Space Shuttle Discovery included Col. Charles F. Bolden (pilot), and Captain Bruce McCandless, Dr. Steven A. Hawley, and Dr. Kathryn D. Sullivan (mission specialists). During this five-day mission, crew members deployed the Hubble Space Telescope, and conducted a variety of mid-deck experiments involving the study of protein crystal growth, polymer membrane processing, and the effects of weightlessness and magnetic fields on an ion arc. They also operated a variety of cameras, including both the IMAX in cabin and cargo bay cameras, for Earth observations from their record setting altitude of 380 miles. Following 76 orbits of the Earth in 121 hours, STS-31 Discovery landed at Edwards Air Force Base, California, on April 29, 1990. With the completion of his second mission, Shriver has logged over 194 hours in space. CURRENT ASSIGNMENT: Colonel Shriver is assigned to command the crew of STS-46. This seven-day mission will feature the deployment of the European Retrievable Carrier (EURECA), an ESA-sponsored free-flying science platform, and will also demonstrate the Tethered Satellite System (TSS), a joint project between NASA and the Italian Space Agency. STS-46 is scheduled for launch in the summer of 1992. Family: Astronaut. Country: USA. Flights: STS-10, STS-41-E, STS-51-C, STS-61-M, STS-31, STS-46. Projects: STS. Agency: USAF. Bibliography: 12, 6029. 1944 September 23 - . Birth of Loren James Shriver - . Nation: USA. Related Persons: Shriver. American test pilot astronaut 1978-1993. Grew up in Paton, Iowa. 3 spaceflights, 16.1 days in space. Flew to orbit on STS-51C (1985), STS-31, STS-46..